Ned grew up in Virginia and Maryland. He received his Bachelor of Arts in Religion and Philosophy from Roanoke College (R.C.) in 1988. It was at R.C. that he met his wife, Ellen, and had his first inclination of being called to the ordained ministry. After graduation, he lived in Washington, D.C. serving with the Cathedral Volunteer Service Community program of the National Cathedral. In 1989, he went back to R.C. and worked as the Assistant to the Chaplain until 1997. While working at his alma mater, Ned earned his Master of Social Work degree from Virginia Commonwealth University. In 1993, Ned and Ellen were married. They moved to New York City in 1997, where Ned graduated with a Master of Divinity degree from The General Theological Seminary in 2001. After seminary, Ned and Ellen moved to Staunton, Virginia where Ned served for three years as the Associate Rector at Trinity Church, and where he was ordained to the priesthood just three days after 9/11. 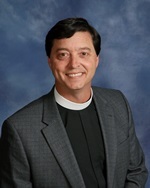 In October 2004, they moved to Louisville, Kentucky where Ned served as the Rector of Calvary Episcopal Church until July 2009. He became the 18th Rector of The Episcopal Church of the Advent on August 1, 2009. He, Ellen, and their four children (Halstead, William, Lou Lou, and Evers) enjoy reading, playing and spending time with family and friends.